You might as well know... Grocery Outlet 's wine selection is 20 percent off through April 3 . 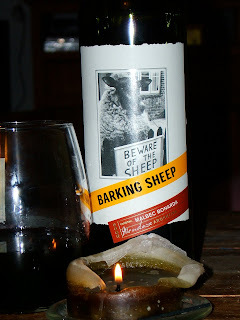 I opted for the Barking Sheep Malbec – review here – love those Argentina reds. And they have the " pure and elegant " Sirius vodka, too - $36.99 elsewhere, but only $11.99 at GO. Pair it with some Santa Cruz sparkling lemonade ($1.49) and a slice of Meyer's lemon (in season right now) and you'll swear it's summertime no matter how hard the rain pounds outside. On the food front, score Ben & Jerry's Flipped Out flavors for $1.49 each, Scharffen Berger 70% Cacao Bitter Chunks for $2.49, 64 oz. organic almond milk for $1.99, Annie's Mac'n'Cheese for $1.19, all kinds of organic beans for 99 cents per can and yummy mondo tubs of hummus for $2.99.